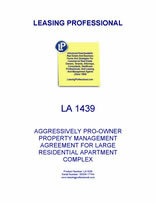 This property management agreement is for the engagement of a professional commercial property management firm for a large residential apartment complex. The manager engaged by the agreement is responsible for the overall management of the residential complex as specified in the agreement. The manager is responsible for the preparation of an annual management plan for the property, in addition to its other duties specified in the agreement.